2018 Food Drive- Help us close the summer meal gap. 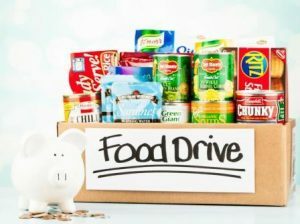 – Renton WA | A & M Insurance Services, Inc.
Bring in any donation during the drive and we will enter your name in a drawing to be held in July for a $25 Starbucks gift card. If you leave a bag at our door make sure your name is in the bag so we know you left the donation, and can enter you in our drawing. In fact, Renton School District reports show 4,027 or 57% of elementary students as of last February were on the free or reduced lunch program. Many working families rely on these meal programs and are left struggling during the summer months to feed their children. Northwest Harvest can use any nonperishable food or monetary donations. Did you know Northwest Harvest can feed a family of three one nutritious meal for just 67 cents? DONATE HERE. We have set a goal of $500. More than 90 cents of every dollar donated to Northwest harvest goes directly to food distribution.